Just recently my wife and I refinanced our home to a lower interest rate. I have refinanced before – but this time – it took longer than usual. I chalk this up to tighter lending guidelines and all that goes with getting a mortgage, post-Recession/Housing Burst. The closing was well over a month ago now – and we’ve still been getting some correspondence related to the refinance including a check for the escrow balance on the old mortgage and other documents. But one “official” looking letter caught my attention when it arrived last week. 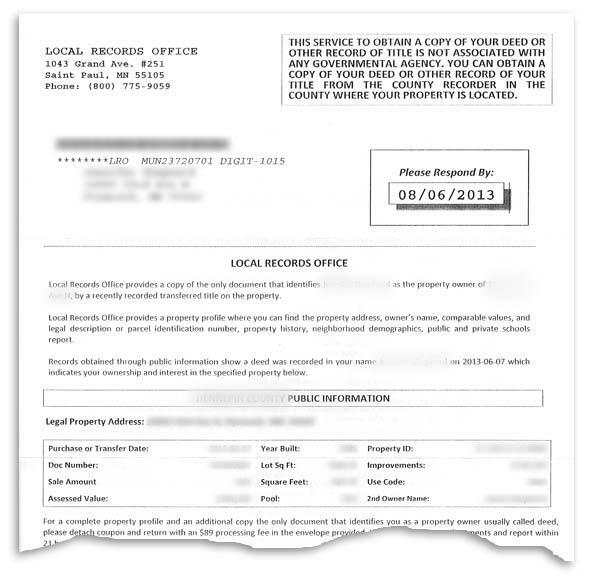 It was from the “Local Records Office” and it appeared to be an invoice related to the closing and requested our response and a check for $89 to get a copy of the “property profile” (or the deed). Oddly enough – all this information is free to anyone that wants it and is typically (if not always) provided to you after your closing. The Local Records Office states their document will give you the property history, neighborhood demographics and public and private schools report (of course, all of this is free and available to you or anyone that wants to know). How does a business like this thrive? Ironically – Local Records Office is operating within the law. They state in different areas in the letter they are not affiliated with the county which your deed was filed, nor affiliated with any government agencies. To top that off, they also state “this offer serves as a soliciting for services and not to be interpreted as bill due“. Not surprising, the placement of these warnings is typeset in all caps (which are hard to read) with little to no space between the sentences – (also hard to read). Crazy huh? Who are they preying on? This is really another lesson in reading things and not always accepting things at face value. You have to be on-guard whenever anyone sends you something through the mail, asking for funds. And, this document totally looked like a bill due. Earlier this year, a relative of mine notified us they were preyed on by a phone solicitor telling them they needed an important update to their computer and they would be able to help install it over the phone. Moments later they were providing them with their credit card number and forked over at least $100. Scammers and schemers are getting more and more creative in the digital age. They have access to a lot of public data and can use it to manipulate you into thinking they are legit. Most legitimate businesses will not call you asking for money. Avoid any of these types of calls or solicitations. If it is a non-profit business raising support for a cause – ask them for their website address and tell them you’ll investigate it further and then donate online or through mail. This gives you an “out” and also gives you more time to consider their offer (if you feel the cause worthy of support). Be wary of fast-talkers and pushy sales folks. To me – this is one of the first signs that a business is not legit. If I get into a situation where the salesperson is pushing me into a sale or getting manipulative, I get a red flag and back out. Always trust that intuition of yours. Get on a “do not call” list. The Federal Trade Commission (FTC) manages this site and provides a resources for folks to “fight back” if they are called or preyed on. Enter your phone number at the site and if – after 31 days – a marketer contacts you, you can file a report with the FTC. Take your time. A few weeks ago a fellow came knocking on our door asking for monetary donations so they could provide care packages for the military. He provided me with all this information to make him look legit including a convincing personal story of his serving in the military. While he may well have been telling the truth – he provided personal information about how much each of my fellow neighbors had just contributed and then started pressuring me into doing the same. This didn’t pass the sniff test and told him that I’d check out his information and donate later if I wanted to. He wasn’t happy. Any solicitor that gives you a timeline or “deadline” is using a negotiation tactic that you needn’t fall prey to. Take your time, do your due diligence and then donate or buy if you so choose. Have you seen or fallen prey to any scams or schemes lately? Any others we should be aware of? Is Life Insurance Good for Mortgage Protection? thanks for pointing this out. I haven’t encountered a scam like that but I have read a similar case at Callercenter.com and while we think the scam is obvious, I’m afraid somebody might just fall for it. The authorities should start treating such calls a crime. Aaron, we got this same letter recently – the nerve!!! We basically never trust anything we get in the mail anymore (same goes for phone calls) unless we’re certain of the sender/caller. Too many scammers out there. Another scam involving official looking documents “TO BE OPENED BY ADDRESSEE ONLY” involves a high-priced solicitation to purchase automobile repair insurance. I guess they go through registration records and when manufacturer’s warranty expires, they hit you up! Great article. Another thing to be aware of with refinancing is the large amount of official looking documents you’ll get in the mail which are advertisements for mortgage insurance (not the PMI kind). They’ll usually have some hook about paying off your mortgage if you die so your family can continue to live in the home. About 99% of the time, these policies will cost much more than a simple term life insurance you or your spouse could purchase and then the money paid at death goes to your family, not the mortgage company. Thanks for the tip Andy!